On Thursday, March 6, 2013, I broke out of the comfort of my apartment in search of the Hilton Hotel where I hoped to swim on a regular basis. 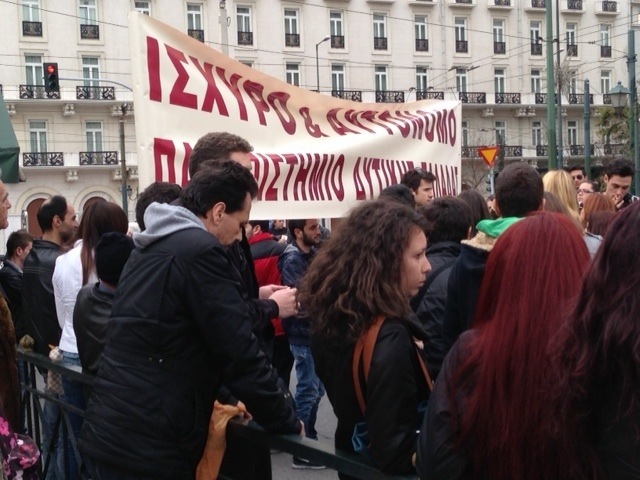 As I reached Vassilissis Sofias, I could see a crowd walking towards Symtagma Square. Change of plans. I followed them. The closer I got, the more police I could see. Finally the street was completely cordoned off, so no traffic except those of us on foot could pass in front of the Parliament Building. 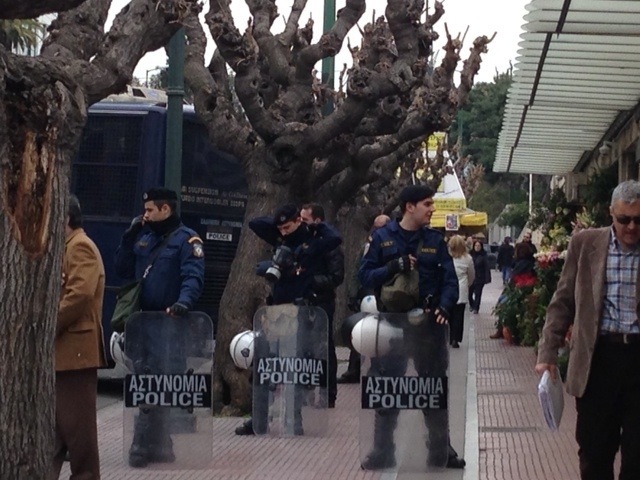 The police were stationed close to the florist I sometimes patronized. The incongruity of colorful, fragrant flowers along side riot-geared, machine-gunned, gas-masked police on the ready made me smirk in painful irony. I was reminded my own protests in the sixties. I am living the class I am teaching at the university, Film of the Sixties. I put on big sunglasses and armed with my iphone readied myself to be a “citizen journalist.” I had tried to do the same this summer during the elections in Spetses. At that time, a friend asked me, “How can you be ‘observing Greece” from the lap of luxury? '” I had been staying in a Villa. Today, living in Kolonaki, another lap of luxury, on my way to the Hilton, and not speaking Greek does create some difficulty. I didn’t understand the signs; I didn’t know what was being protested. Most of the people in the streets were young, so I imagined the gathering might be about unemployment which is about 25% for youth. My classes had been canceled on Tuesday due to a protest against the merging of departments at the University which would result in an elimination of part of the Humanities. However, I thought that protest took place on Tuesday. I took photographs, placed myself directly in front of the Parliament, and waited to see what would happen. There seemed to be about two or three thousand people. Standing next to me was a “woman of a certain age” as the French would say. She petted a dog who like many in Greece has a collar but belongs to no one. She spoke to me in English after I made my one statement in Greek that everyone seems to understand, Then milaw Ellinika. I don’t speak Greek. She told me that the dog’s name is Victory. We laughed. I found out that the protest concerned the changes being made in education, that is, firing of teachers, getting rid of some schools. I was in the right place. After some discussion about this situation, she confided that she had given up her Greek citizenship. Shocked, I asked her why. She said she couldn’t be part of a country that handled this crisis so stupidly, whose leaders were corrupt and still no one did anything. I told her that I had wanted to quit the United States when George W. Bush was president, but my husband had insisted that “someone had to stay and fight.” She went on to say that she is having trouble living in Greece because she speaks her mind, saying what other’s don’t want to hear. I wondered if she was being harassed by people from Golden Dawn as she kept mentioning cults. However, that wasn’t the case. She is on her own and is in conflicts with her community, with her neighbors where she speaks freely about her frustration with Greece. I was reminded that Freedom has a price. Just that morning, I had been considering applying for a Greek passport, having dual citizenship. I can as my grandfather was born in Greece. Another contradiction, another consideration. What does it mean to be Greek with the blinders of romanticism taken off?